The solo directorial debut of Greta Gerwig, who also wrote the impeccable screenplay, Lady Bird is a lovely and deeply poignant coming of age film that finds the perfect balance between being funny, moving, bittersweet and a little edgy, just like its main character. She has pink streaks in her hair, insists on being called Lady Bird, attends a Catholic school with mostly rich kids but pushes back against the religious doctrine she is being taught, and is ashamed of her modest house on “the wrong side of the tracks.” All of this puts a rift between her and her mother (Laurie Metcalf), whom she is struggling to get along with. While her supportive father (Tracy Letts) puts on a brave face, he’s also struggling to come to terms with losing his job, making things even tighter for the lower middle class family. Throughout all this, Lady Bird tries to navigate the usual experiences of being a teenager, like dating and maintaining friendships. Saoirse Ronan carries the film with a spectacular performance, fully embodying this unique character in a way that lets us both relate to and care for her, even when she does unlikeable things out of teenaged angst. Laurie Metcalf does beautifully textured work as a mother not ready to let her daughter go, even if her coping mechanisms are causing her to come off as distant. A scene between them in the kitchen that comes late in the film, with Saoirse Ronan yelling as Laurie Metcalf stays silent, continues to linger in my mind as one of the most powerfully acted scenes of the year. Tracy Letts does wonderfully understated work as a man trying to hide his own depression for the sake of his daughter, in a moving dramatic arc that the playwright turned actor handles brilliantly. Helping round out the uniformly excellent ensemble cast are Lucas Hedges and Timothée Chalamet, who both shine in memorable roles as the pair of guys who become the object of Lady Bird’s affection at different points in the film. The former brings nuance to his role as a broadway theatre geek who is undergoing his own awakening while dating her, and the latter is pitch perfect as a brooding wannabe existentialist who reads books, smokes cigarettes and presciently warns about government surveillance. Greta Gerwig’s writing sparkles with sharp dialogue, and provides many wonderfully observed scenarios for her heroine to navigate, while also offering an intuitive exploration of its characters. Her screenplay carries with it the same sharp wit that she brought to Frances Ha and Mistress America, which she co-wrote with her frequent collaborator Noah Baumbach, and the title character here indeed comes across almost like a younger version of the characters that Greta Gerwig herself portrayed in those films. But as much as Greta Gerwig’s sublime sense of humour shines through here, Lady Bird also plays with the same sense of underlying poignancy that has become equally emblematic of her work. The film has been described as being semiautobiographical, loosely inspired by her own teenaged years growing up in Sacramento. She has clarified these statements by saying that, while the events of the film are fictitious and it’s not an exact replica of her own experiences, the emotion of the film is absolutely real, inspired by the things that she felt as a teenager. And we can tell, because Lady Bird has a lovingly observed quality to it that feels real. The film also beautifully shows what’s happening on the peripheries of Lady Bird’s life and in America at the time, with her parents struggling to make ends meet in a changing economy, and news of the Iraq War flickering by on TV. And in this way, Lady Bird becomes as much a snapshot of America in the early-2000s, a world still recovering from being forever changed by 9/11, as it is a portrait of a teenager becoming an adult, showing both its character and her country in a state of flux. It’s not dissimilar to Boyhood in this way, and there is also an inherent nostalgia to this pre-iPhone world. There are so many layers to both the story and characters, and thanks to both Greta Gerwig and Saoirse Ronan, Lady Bird is a rich and deeply felt work that should be savoured. The big dramatic moments all double as quiet character beats, the little things that happen in all our lives and cumulatively help shape us. 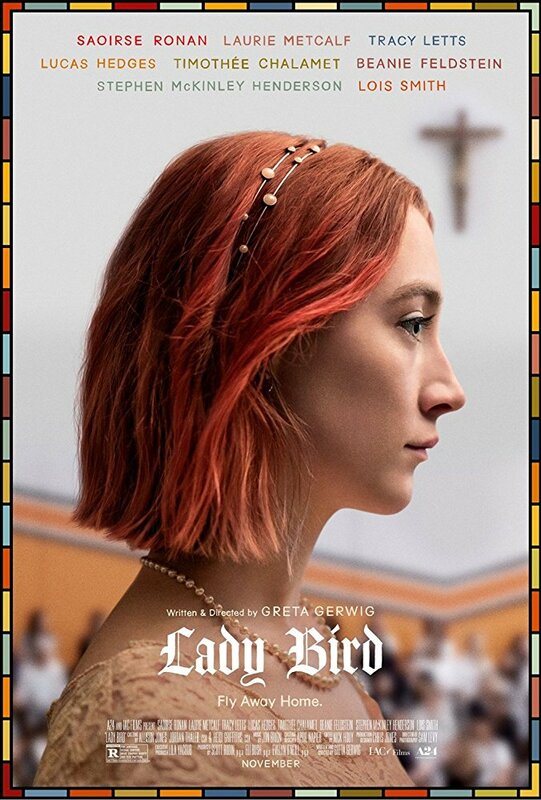 The narrative could also be read as subtly telling the story of a teenager losing her religion and rebelling against the church as a way to go against her parents – the very fact that Christine insists on being called Lady Bird clearly represents a rejection of her baptismal name – before slowly finding her faith again in a moment of self doubt. Greta Gerwig directs this all with just the right touch, delivering one of the most beautifully crafted films of the year. She displays both a deep understanding of her characters and a sense of clarity for her own vision, while also paying tribute to many great directors before her. The influences of Woody Allen, Noah Baumbach and Wes Anderson, whom are all artists that she has worked with, are especially felt in the film. There is a lovely and textured quality to the whole thing, and this is heightened by Sam Levy’s warm cinematography, which has a filmic grain to it that recalls an era before digital fully took over. The tagline for Lady Bird is “fly away home,” and this is fitting not only because of the childhood rhyme it evokes, but also because the film tells the story of a teenager wanting to leave her family and the place where she grew up in order to find herself, but coming to appreciate her own life in the process. This is an instant classic in the coming of age genre, offering a uniquely enjoyable and emotional ode to leaving high school and your childhood behind, while also allowing us to reflect upon its deeper themes of home and family. Put simply, I’m in love with this movie.